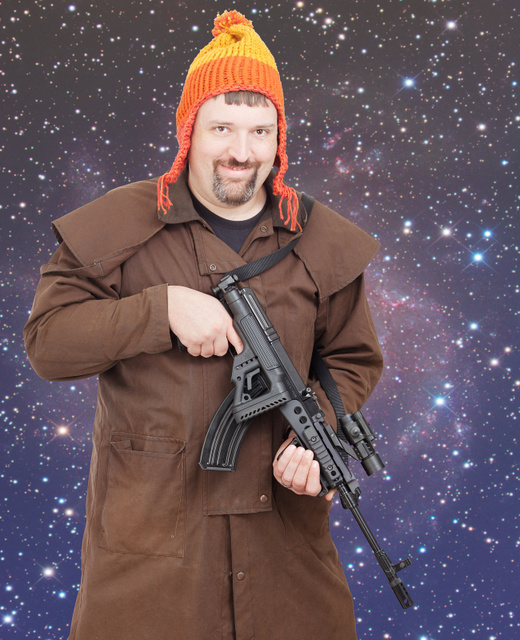 This entry was posted in humor, interesting people, rifle and tagged browncoat, Czechpoint, Serenity, vz58. Bookmark the permalink. Our time’s Orcish sword has come so far…. Browncoats for life! No power in the ‘Verse can stop us! Jayne was not a Browncoat. Yes, it’s possible it could be bnenad because of the magazine capacity, but the fact that it’s a pump-action rather than an autoloader makes that less likely. Saiga shotguns built on the AK action with high-capacity magazines are more likely to disappear first. Can it even eject spent cartridges with the stock folded?!? Isn’t in ejecting UP? not left or right? Actually it is technically NJ legal. It is a pump otaicn shot gun and can legally have a pistol grip, and up to 15 rounds in the magazine. If it were semi automatic, it would be illegal just for the pistol grip. Read the NJ gun laws closely. Pump otaicn shot guns have lots of perks. OMG! You got him to dress like that? LOL sweet! Hope to see all of you again soon, I miss all of you. He dresses like that on most days! Methinks, Jayne didn’t have no double chin, but kudos for the hat. Actually, Sir…as serious a proponent of firearms as I am; wrong choice for a space ship. That’ll do some serious damange to some very sensitive stuff in a space ship. You might end patching breaches in the hull. Yes. Anytime I think of guns in space I’m reminded of the Babylon 5 episode where Garabaldi digs out his grandmothers old “slug thrower”. He discusses how they went out of vogue because something that can poke holes in the hull isn’t too popular in space. Frangible Ammunition, Subsonic will do the trick nicely…without the hazard of poking holes in a pressure hull. What brand of folder it that? A man wears a hat like that, he don’t need a gun, ’cause you know he ain’t afeared of nothin’. The folder is the Zahal rising cheek peice folder, currently available from CzechpointUSA. I have one on my vz-58, great stock. The scope mount looks odd..love the coat. I have to say I’ve fired mine folded – hard to be at all accurate, even with a red dot. Yes, it would fit in the Firefly universe quite well.